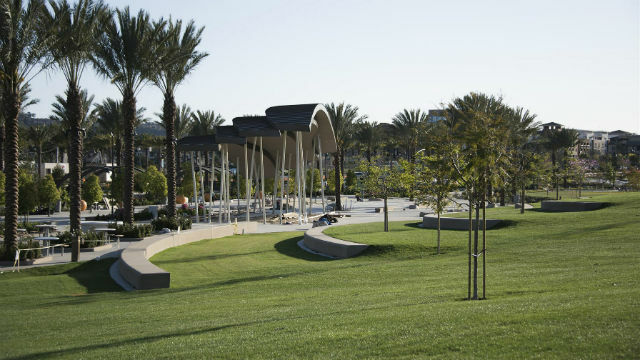 Civita Park, the largest park in Mission Valley and centerpiece of a major residential development, will be unveiled at a public celebration on Saturday. Festivities begin with an 11 a.m. ribbon cutting and continue until 3 p.m. with concerts by local bands The Whisper Mill and Part Time Model, performances by the Fern Street Circus, gardening presentations, photo opportunities with exotic birds, tai chi demonstrations, yoga classes and a bounce house and obstacle course for kids. The event is free, and food will be available for purchase from a variety of food trucks. Developer Sudberry Properties chose the Arbor Day weekend to mark the opening of the first two phases of the 14.3-acre park, which cascades down the former quarry site at Civita Boulevard and Russell Parkway, just north of Friars Road. The initial two phases of the park span 10 acres and feature a waterfall, outdoor amphitheater, water jets, a plaza for special events, picnic tables, a community garden, a dog park, basketball courts and extensive trails and walkways. The 70-year-old sand and gravel quarry is being developed as a transit-oriented urban community, with 4,780 homes and apartments, approximately 480,000 square feet for a retail center and 420,000 square feet for offices.